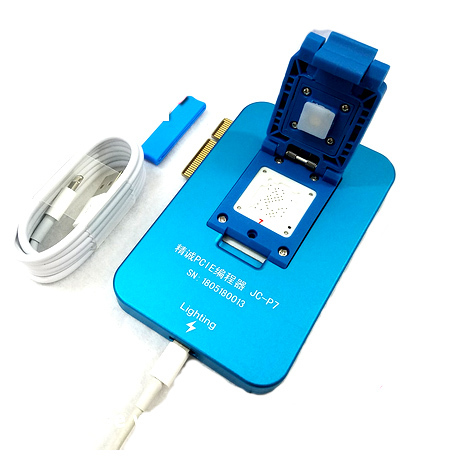 JC-P7 PCIE NAND Test Fixture Designed to Change iPhone NAND underlying data, Serial Number SN / Model / Country / Color modification. JC P7 Nand Repair Programmer not only can working on JC software, but also can working together with JC pro1000S Programmer. 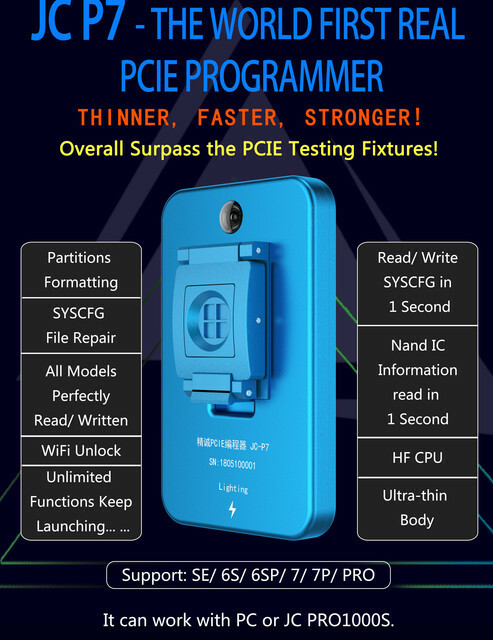 you need re-store the nand by JC PCIE or the iphone motherboard Test fixture. 1. JC P7 can support partition formatting and partition backup, Test Fixture not support. Partition formatting can solve some hard disk flashing errors, while partition data backup can do data analysis. 2. JC P7supports bottom-level depth repair, Test Fixture does not support. 3. JC P7 8 seconds to write the bottom layer, 7P only needs 1 second. P7 adopts the latest version of the PCIE protocol, which supports reading and writing of all types of hard disks without selecting disks. 4. AS for the new hard drive is the same with JC-P7 and Test Fixture, you need to brush machine, and then can read and write, but the new disk customers bought are brushed, so you can read and write directly. 5. P7 support computer online operation, while supporting PRO1000S offline operation. Support iPhone 6S/ 6S Plus / SE / 7/ 7 Plus/ iPad Pro models: SN, country, color modification. Support iPhone 6S/ 6S Plus / SE / 7/ 7 Plus/ iPad Pro NAND underlying data, This iPhone NAND Test Repair machine is the professional Phone repair tool, need the professional skills and knowledges.